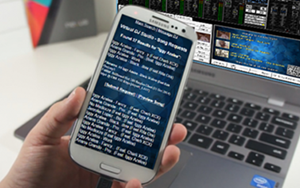 With our all-new MyDjSongBook.com fully-hosted server-based Web App, your customers can quickly find songs, send requests, and even upload pictures for the Karaoke Screen -- right from their smart phone. 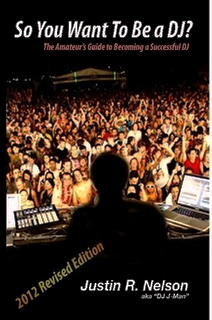 Gone are the days of printing and keeping up-to-date your Karaoke song books - with MyDjSongBook your books are always up-to-date, and requests are received right inside the Virtual DJ Studio interface. For information about the older, built-in app server in VDJ, please see this page. Note that you can use both apps - the Hosted version for your customers, and the built-in version so that you can use the App Control features. 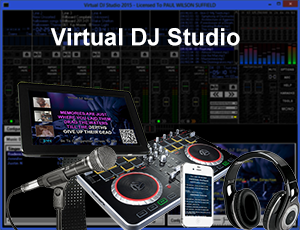 Note: MyDjSongBook.com is not a third-party application - it was developed by myself (Justin Nelson), developer of Virtual DJ Studio, for use with VDJ, and is hosted on this same secure server. Unlike the older, built-in VDJ App, this new hosted app does NOT require that your customers log into the same WiFi or type in an IP address. Instead, they just visit yourname.mydjsongbook.com in any modern browser. No app installation required as it is solely run within the web browser. You can also use the shorter yourname.mydjsb.com, which is easier to type and easier to fit on your Karaoke Screen. It immediately redirects to the secure full URL. Plus any other browser that is fully HTML5-compliant will work just fine with the app, and it looks, works, and feels exactly the same on all platforms. 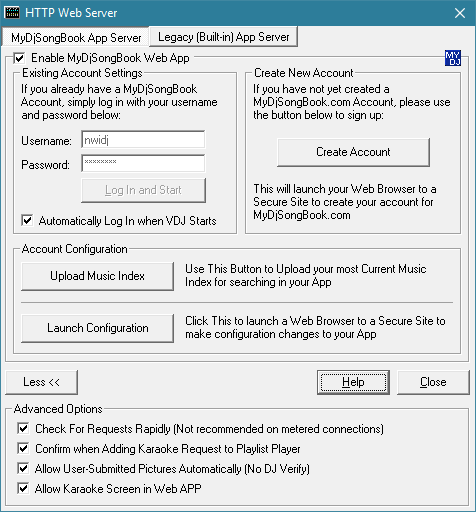 First, check the box Enable MyDjSongBook Web App. Then enter your username and password, that you created when you signed up. When you click Log In and Start, VDJ connects to the server. If all goes well, the button turns grey and you're signed in. You will see the "MDSB Server" turn green in the VDJ Requests tab. Choose Automatically Log In when VDJ Starts to ensure it logs in every time. After completing a full index of your Music and Karaoke files, click the Upload Music Index button. You can only upload once every 12 hours, so be sure you have indexed all files you want to be searchable by your customers. This process may take a few minutes, depending on your connection speed and how many songs are in your index. There are some advanced options at the bottom of this dialog as well - click the "More >>" Button to reveal them. This option polls the server once per second to see if any requests or picture uploads are waiting. If so, they will show up immediatley in your Requests tab. Without this option, it polls every five seconds. This ensures that you don't accidentally add Karaoke requests to the Playlist line. This is just a safe-guard - uncheck this if you use the Playlist Player for your Karaoke playback. When a user submits a Profile Picture, normally you would have to verify their picture and choose whether or not to use it. Checking this option lets the user's picture take over immediately. If that user is on the Karaoke Screen as an Upcoming Singer, their picture will be displayed for all to see within seconds of their upload, so use this option wisely! You can allow users to Follow Along on their device with the Karaoke graphics (lyrics). This option uploads a small file to the server, which the web app interprets and displays the graphics in sync with VDJs current position. When this feature is enabled, a button will appear under the Currently Playing in the app when a Karaoke song is playing, linking them directly to the Karaoke screen part of the app. All communication to and from the App Server and VDJ and your customers is fully encrypted over SSL. No user information can be comprimised by hackers, even over an open WiFi connection. A Padlock icon appears in the address bar, ensuring your visitors that their information is safely transmitted (just like this site). You can tailor the app to suit your needs - enable and disable features, create color schemes and layouts, even (limited but expanding) multiple-language support. You control every aspect of what the user sees, even if you have no HTML knowledge. Sign Up Today and enjoy the introductory price. Your customers will love you for it, and it makes life easier for you, the DJ/KJ! It's like having an assistant and song books all in one.